Available on R-Marcel and 1 other release. About the things I never knew"
This great folk song from Don't Get Bent Out Of Shape uses a short parade of famous characters and persons to express the main point "Don't believe the junk they put on you." Beck sounds wise beyond his years. Beck borrows the end of this verse as the opening line for "Don't Believe the Joke." What you shouldn't believe is that Tom Joad, as a parolee who lost his family, is to be feared. In Guthrie's song, at least, Tom Joad is portrayed as a hero. The second verse alludes to the story of Jesus Christ faking his own death. Daniel Johnston is a relatively famous outsider musician. Beck has covered a few of his songs over the years: "Devil Town," "Some Things Last A Long Time," and "True Love Will Find You In The End." Johnston was a huge influence on Beck, especially on his early tapes, and there a numerous other references and musical connections. 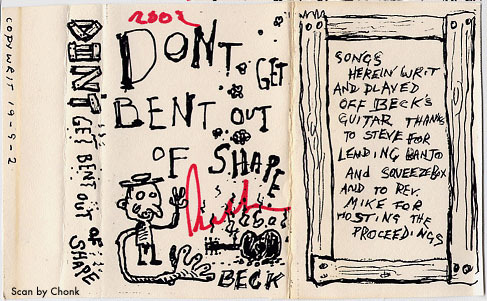 I mean, just about every Daniel Johnston song sounds like a Don't Get Bent Out Of Shape outtake, so the sound and style influence on Beck was clearly strong. The final verse begins with a phrase Beck likes: "Now I'm biting on the bullet hard," which was used in "Soul Suckin Jerk," as well. Don't Get Bent Out Of Shape, an old homemade tape, didn't have a tracklisting on it. Initially, the lyrics were considered to be "don't believe the joke they put on you" so we just used that as the title. A better-quality rip of the tape however somewhat makes it sound like he says "junk" not "joke." I'm not 100% sure, but slightly more convinced so we changed the name accordingly.